Renewal means to begin again or to replenish, to revive, to recover. I know I’m not alone in seeking renewal from the Lord. We can find ourselves spiritual depleted by worry, grief, anxiety, anger, or a host of other things. Where do we find the strength to revitalize our spiritual life so that everything else falls into place? Our struggles with sin, finances, others can leave us tired and weak. Our addictions and habits can rob us of happiness and freedom. Our enemy can convince us that we are not making any progress. Our sin can become more important to us than our Savior. Life can wear down our faith. 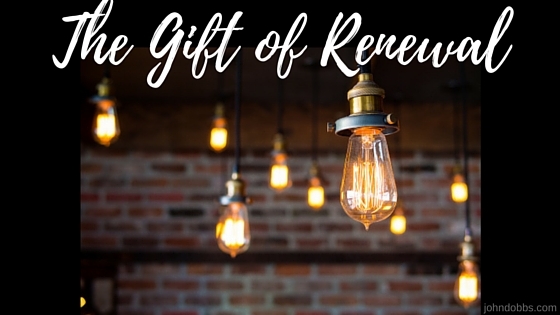 Renewal in our hearts is vital for our ongoing relationship with God. The Scriptures point us to some truths that can bring a new and renewed energy to our service to God. Renewal Comes From Repentance. There’s no escaping the truth that our own sin, left unattended and growing in our hearts, can rob us of our spiritual vitality. Once David confessed and turned away from his sin, he could feel free to ask God to renew a steadfast spirit with him. Renewal Comes From Hope. When we are spiritually drained it’s hard to see hope on the road ahead. Sometimes even our best efforts to lift the spirits of a dragging faith are of no effect. We can give up. But don’t give up! There is help and hope from God! Keep your focus on God who will come through with the strength you need. Renewal Comes From Our Thoughts. How many are struggling to experience renewal while still trying to live life according to the ways of the world? The world and all of its promises of joy and peace is under the control of the Enemy, and therefore can only bring us heartache and pain. We need to revisit the way we think about things. How does God view this world? How does Jesus want us to see things? What would happen if we focused on His will rather than our own? Renewal Comes From Perspective. We can lose heart when focused on the material world in front of us at this moment. Our bodies, our world, our lives will ultimately come to an end. It’s the inward person we are that not only exists but also grows daily. The Bible acknowledges that there will be troubles; suffering is a distinct reality. What will we spend our time contemplating … the troubles and hurts or the promises and joys that Christ brings? Keep your eyes on Jesus! Renewal Comes from Rebirth. There is a spiritual renewal that doesn’t come because we’ve worked hard enough or done enough to deserve it. In an act of grace God saves us and sends a renewal by the Holy Spirit. If you have not been baptized, this washing and renewal awaits you. If you have been baptized, then the Holy Spirit lives within you … is poured out into you … and we need to ask Him to supply the renewal we need. Renewal is needed and available. *Seek Gods’ help in prayer for renewal of your commitment. *Make a specific list of sins that need to be focused upon so that you can repent of specific sins. *Seek out someone to pray with you for specific areas of life. Look for someone who can hold a confidence and someone who is a person with a committed prayer life. *Baptism is an important acknowledgment of your submission to God and trusting Him to do what only He can do … remove your sins. If you haven’t been baptized yet, seek out someone you trust to help you with that process.